Yes, I did say dragon. I have been sewing all week – and usually I would have to say I can’t show you anything as it has all been for clients. But I just had to show you this so I asked especially for permission. Thank you Mrs N! 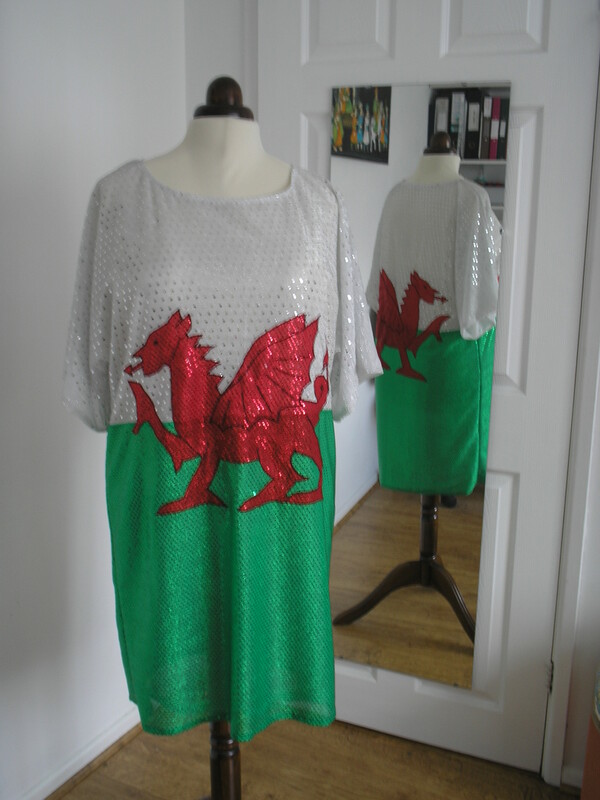 Behold Bessie modelling the ‘Welsh Dragon Dress’. It was self drafted – a very simple t-shirt shape with no darts. This was made for my client as a gift for her friend who is a big Welsh rugby supporter. I think we might spot her in the crowd wearing this! I really enjoyed doing something a bit different – and although the dragon was time consuming to applique onto the dress (front and back) I quite enjoyed it once I had got into the swing. Good fun to do. I hope the Welsh team play particularly well for her. 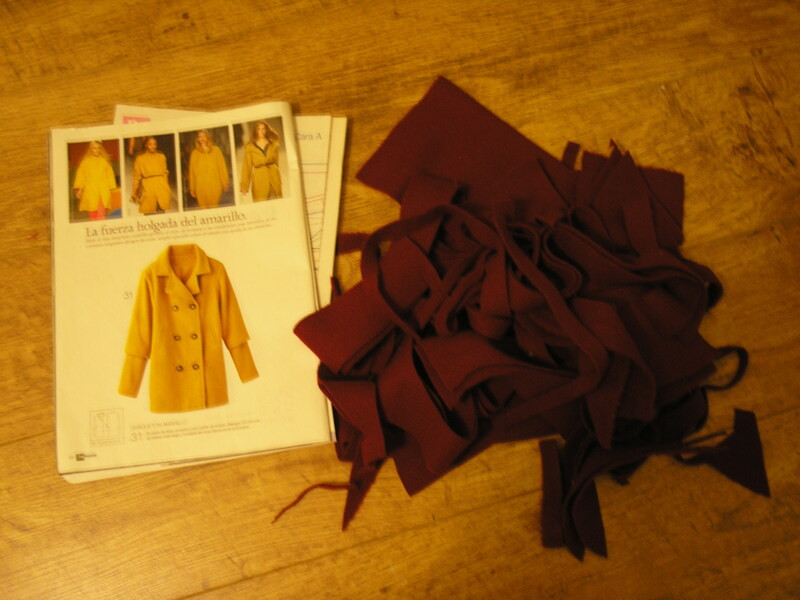 I managed to trace the coat pattern from the Patrones magazine on Sunday as I hoped, and trimmed the paper pattern pieces in my half hour on Monday. 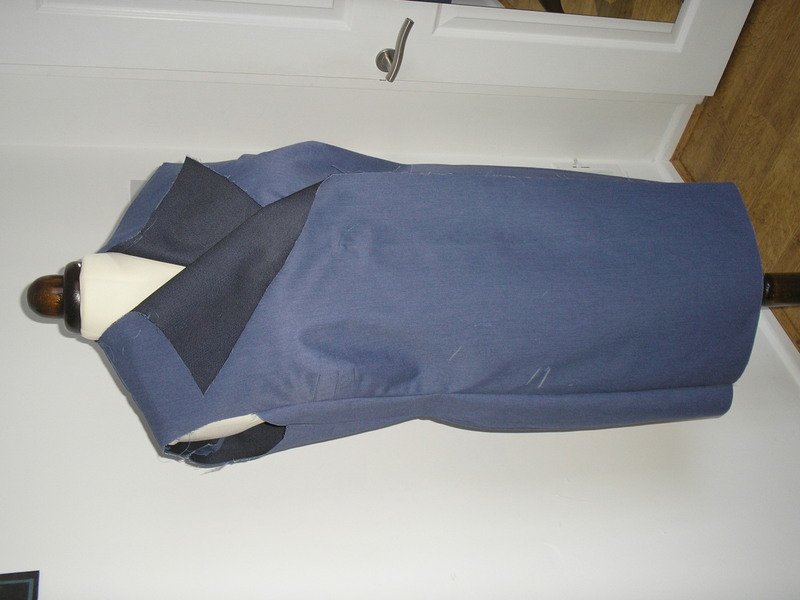 I cut the fabric yesterday – the pattern fitted but only just! 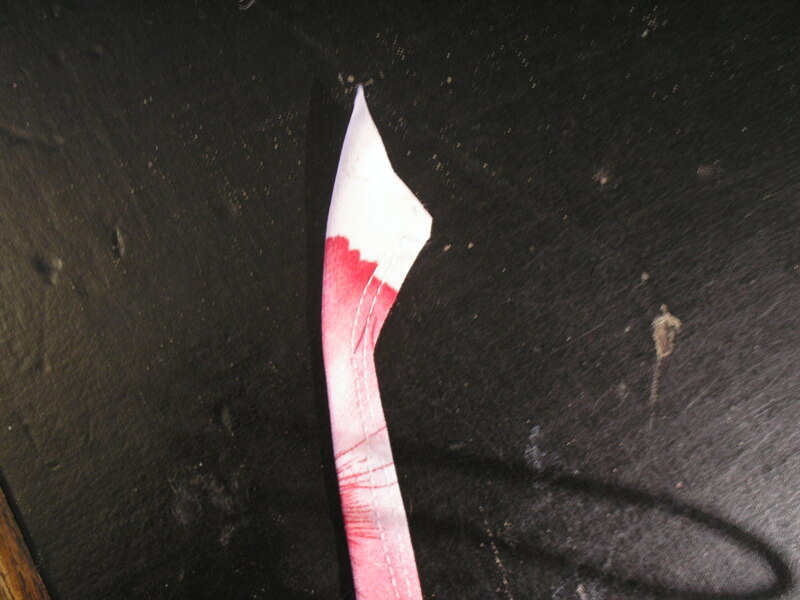 The photograph shows what was left. There isn’t a good sized piece left at all. 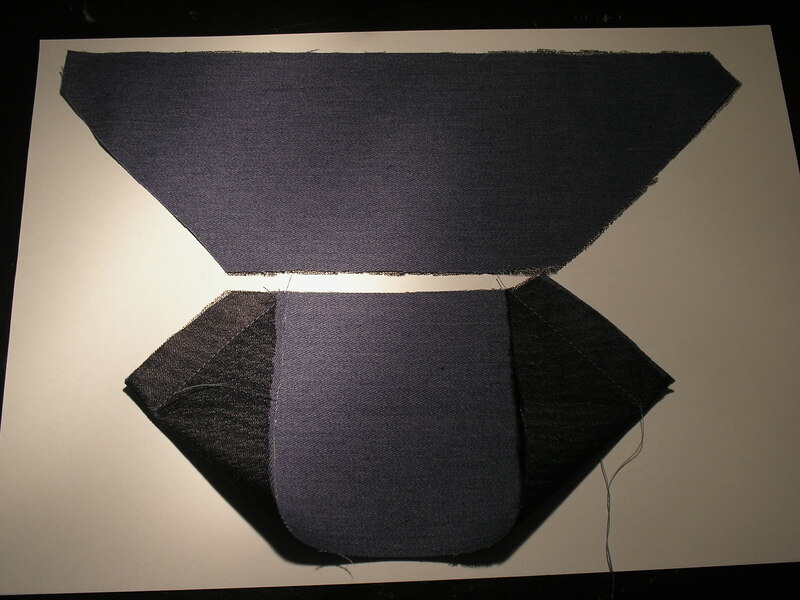 I kept what there was so that I can test interlinings before doing the work to the coat pieces. I have decided I don’t want to make this a ‘project’ so I wont be using canvas and pad stitching. A bit of speed tailoring needed this time. I hope to make a start sewing this over the weekend so maybe I will have something to show you in a couple of days. There is still time to leave a comment to add your name to the ‘Pattern Pyramid’ draw so why not join in! I am still hollygagging about trying to decide what I really want to make for myself in my daily half hours. I know I want it to be autumnal. I think it will probably be a jacket. I quite like the idea of a cape – but don’t want to end up looking like Batman. Oh dear – decisions, decisions. 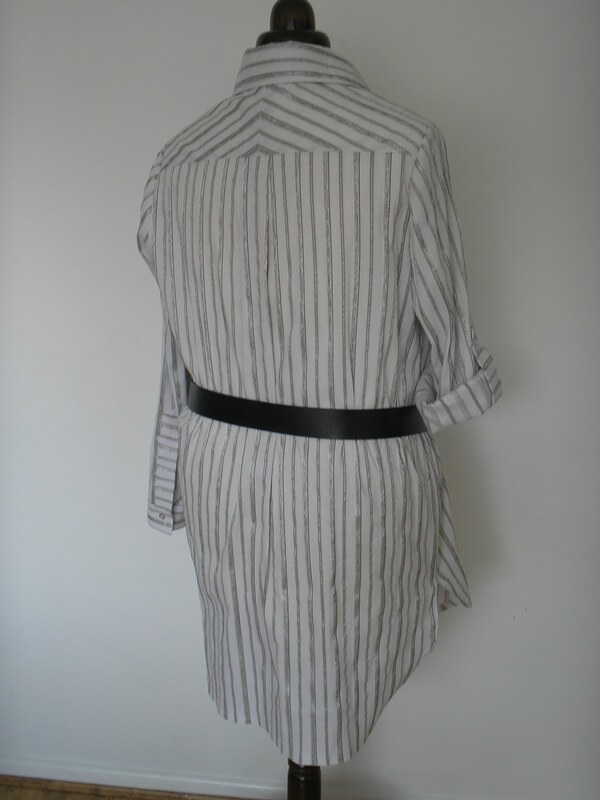 Whilst I was in a mental muddle I had a job from a client to make a copy of an artists smock. I loved how useful and easy it was, so I made another for me. 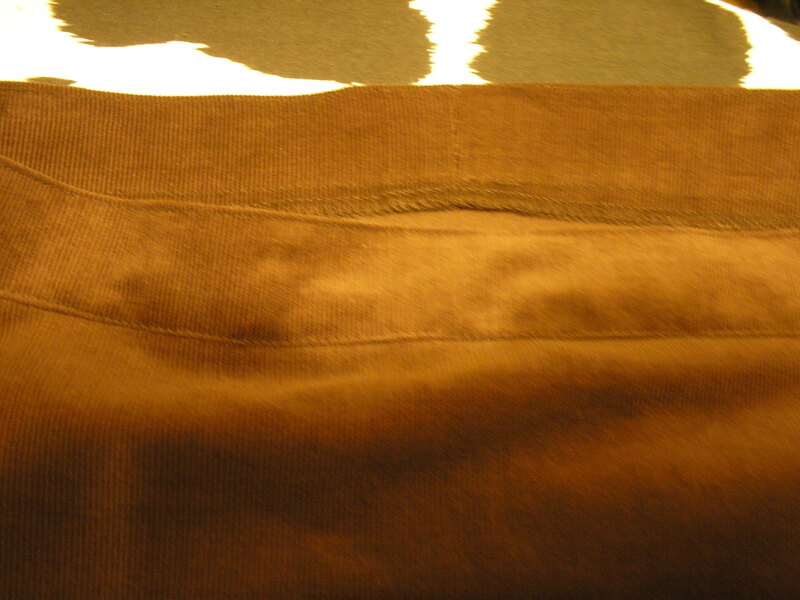 The original was made in a cotton twill but I decided to make this in my cotton baby cord in a lovely chocolate brown. I suspect that I am going to use this quite a lot as the weather starts to cool. The pattern was very easy to make and I have included my workings here for you. 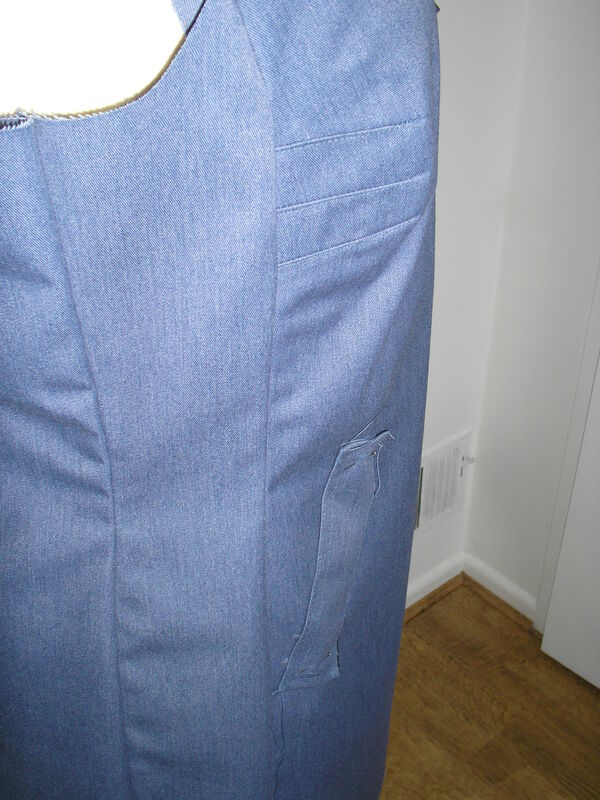 I have not allowed for any seams or hems, or the turning on the top of the pockets so don’t forget to add that onto your pattern. I overlocked all the pieces before I made this up as it was much easier than trying to catch all the edges of the gussets! (Call me lazy if you want). I sewed the pockets and attached them to the front piece, then sewed the shoulder seams , then worked the neckline by sewing the collar piece into a loop and then to the neck edge (collar seam to the CB), then turning it in and sewing inside to secure it (I overlocked the raw edge and left it out but you could make a turn and ‘stitch in the ditch’ from outside). Stitching the top edge makes it look a bit crisper if you want to do that. 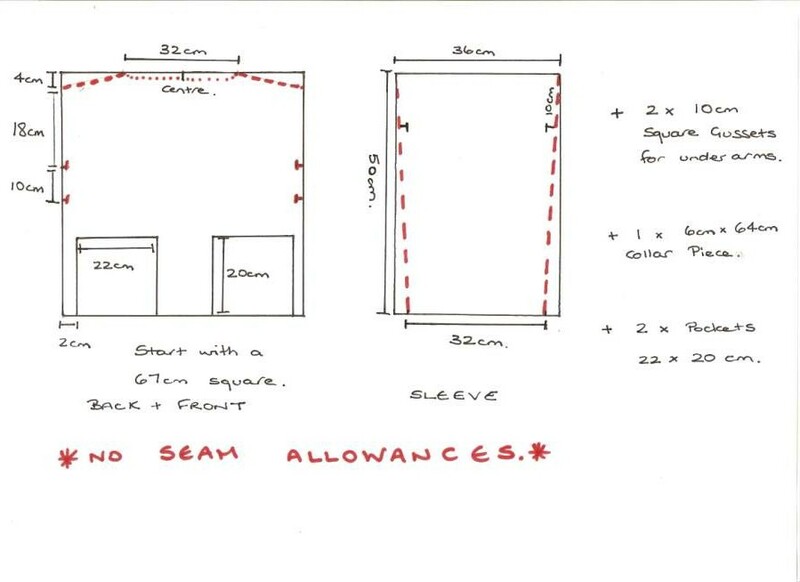 Centre the top of the sleeves over the shoulder seam and sew in place – leave the seam allowance free to enable you to insert the underarm gusset more easily. 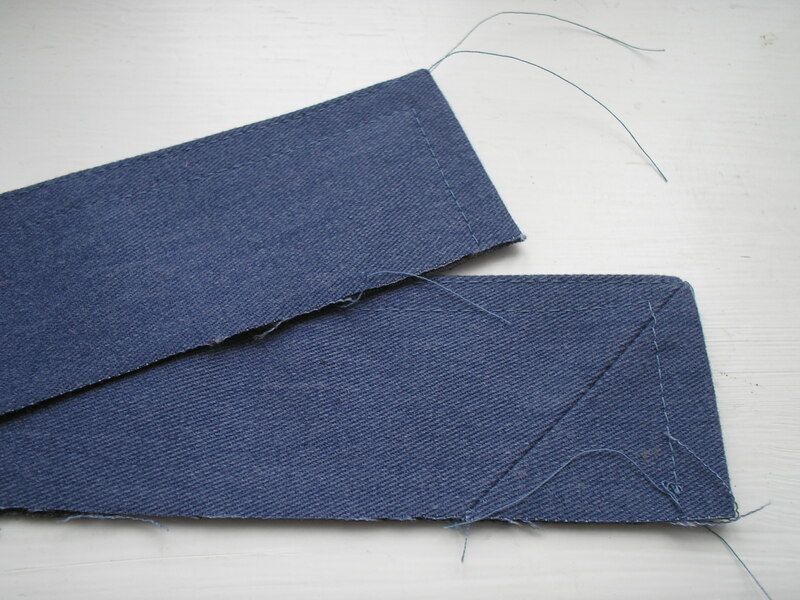 Sew the gusset into place – I used the marks on the main body/sleeves to guide me and sewed so that I could see the point I needed to stitch up to. When you have all four gusset seams completed sew the sleeve seam, and then the body seam. 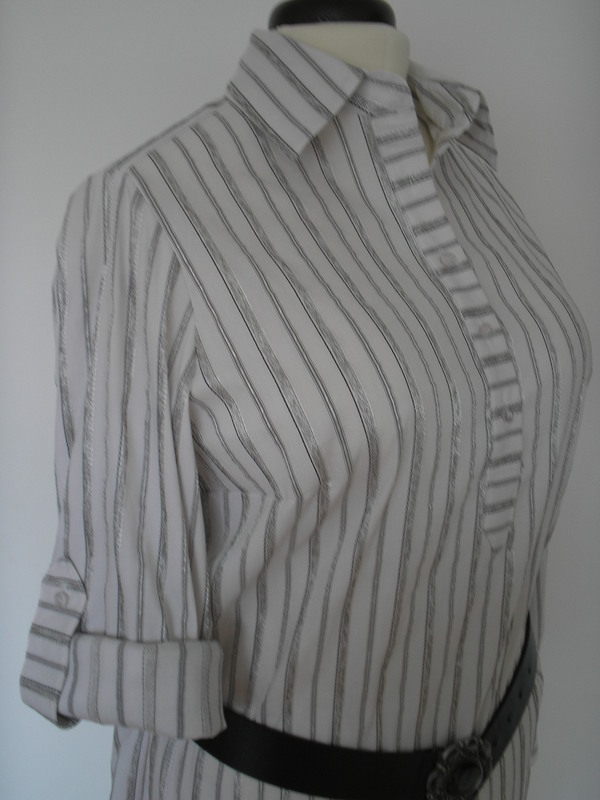 All you need to do now is to turn up a hem on both sleeve and body. Done! In addition to this top the management asked me to knit more little hats for the Innocent Smoothie fundraiser for this year. Everyone in his office is knitting some and he didn’t want not to contribute. I think I may teach him to knit before next year! If you want to join in with this campaign check out their website. 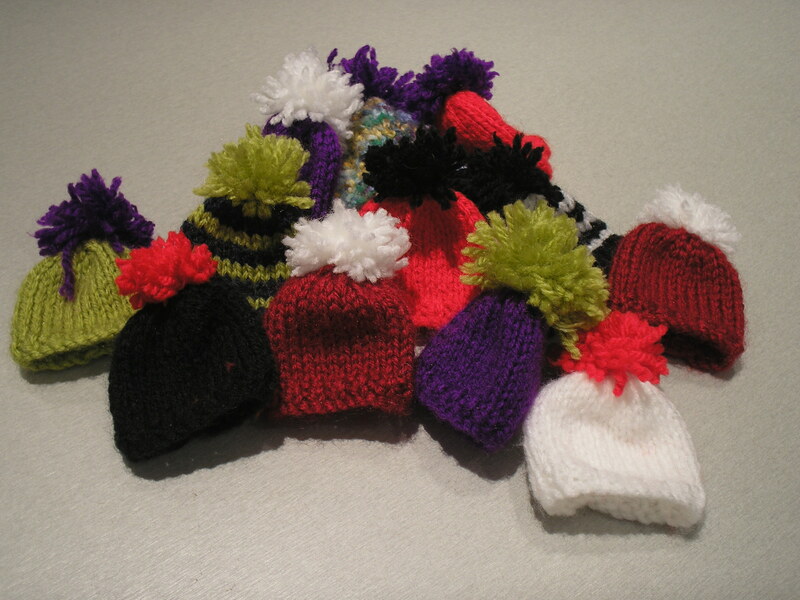 They are really easy to knit and raise money for Age UK. Maybe I will work out what I really want to make soon – it would be nice to have something new that actually suited the season! P.S. Bessie will be wearing the top for a little while. She is a bit upset at being found ‘naked’ by a client who remarked ‘That’s a big girl!’. I didn’t have the heart to tell her it was ‘me’ (I wonder if she has worked it out yet?). The diet starts …….whenever the chocolate runs out. OK. I know I am a few days late with this shirt – but like I said in my last post I was going away for a few days. Want to see my cabin? Well it was mine – but only for the week. 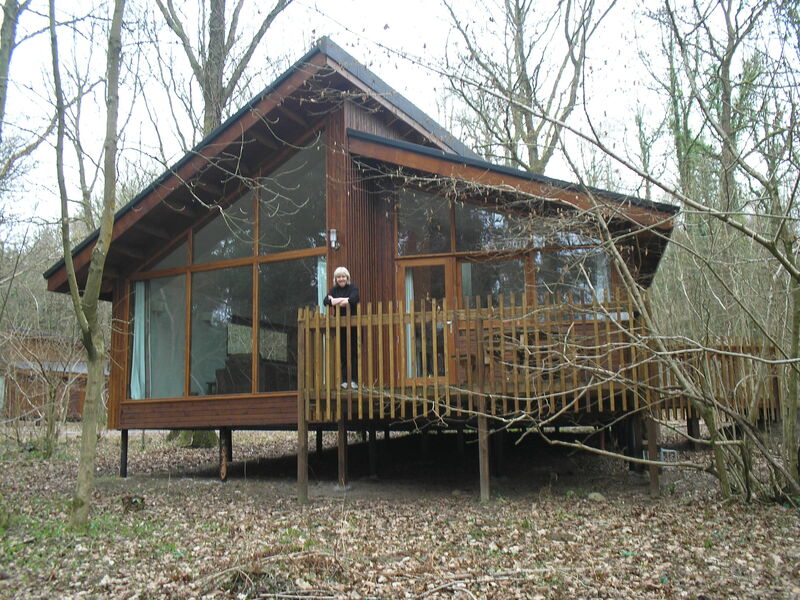 It is in the lovely Forest of Dean and really belonged to Forest Holidays. 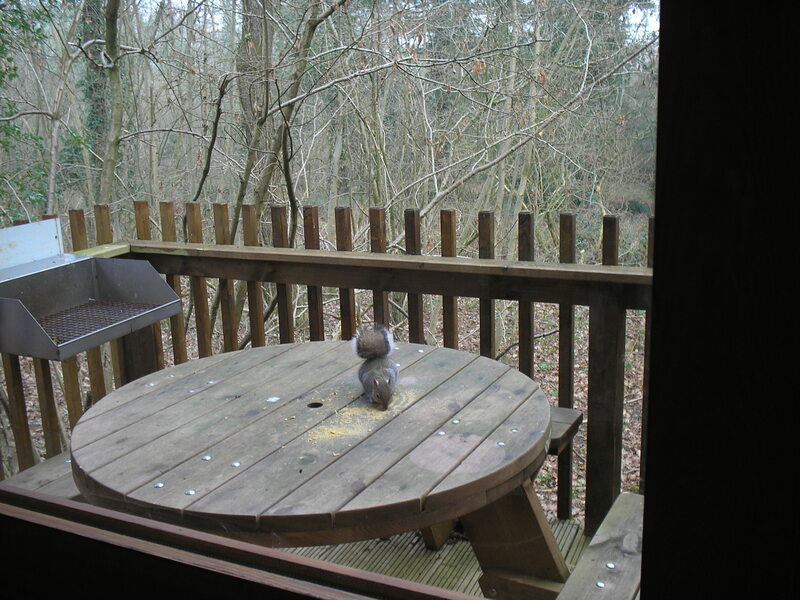 We had a very reviving few days of unseasonably warm weather – and even had guests for breakfast on occasion!Joking apart – we had a great time, did lots of walking, and have come home refreshed and ready to get on again. 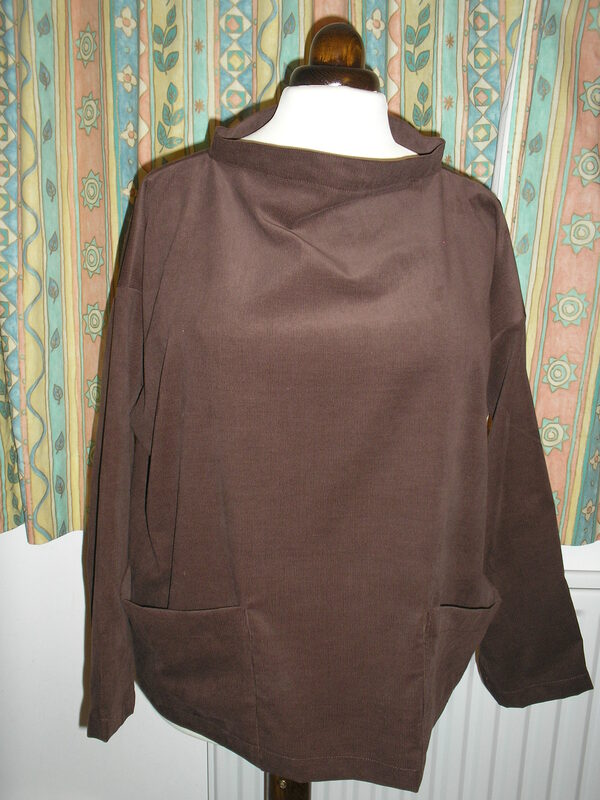 So…..
stretchy cotton mix (from stash – I can’t remember where it came from) which caused a few problems with setting in the sleeves without it creating little tucks. After a bit of unpicking and careful re-sewing it looks fine. 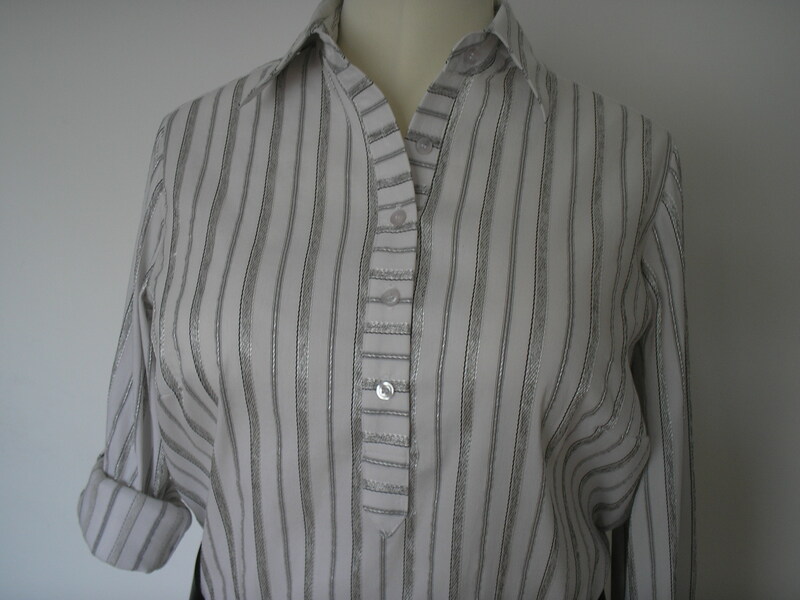 I wanted the buttons to be virtually invisible – the fabric does enough on its own – so I used very basic small white shirt buttons and I am very happy. The pattern was basically Patrones 311 style 6 – but as I detailed in my last post I made a few adjustments to make it more wearable in the wonderful UK summers. As I wasn’t able to get a decent photograph on me (and the management is back to work) I had to rely on Bessie to model for me. I am very happy with this shirt(dress) and I will probably wear it with leggings/footless tights unless it is really hot (and I get the fake tan evenly on my gleaming winter white legs). I will almost certainly make it again and may just fiddle the pattern to make this little beauty. It wont be too difficult to make the necessary adjustments to give this pattern – and I can steal the ruffles from style 26 to try them out! February is a winner. Lets see what I make of March. Bessie: How many months are there in a year Kim? Kim: 12 Bessie, everyone knows that! Bessie (Sighs): Really Kim? And how many jackets have you made for your JAM this year? Kim: Hurrah! 2 now! OH! Now I see what you mean……. Bessie: Yes Kim. 10 left. Not 8. 10. Bessie: Better get a move on then. I have had a busy weekend finishing off the details of my newly decorated lounge (re-hanging pictures etc). Whilst that was needed I really wanted to do some sewing. I traced the patterns I wanted to use during last week so was all ready to cut out and sew three garments. I cut 2 out last night (supposedly watching TV but I missed more than I saw) so I was ready to sew today. 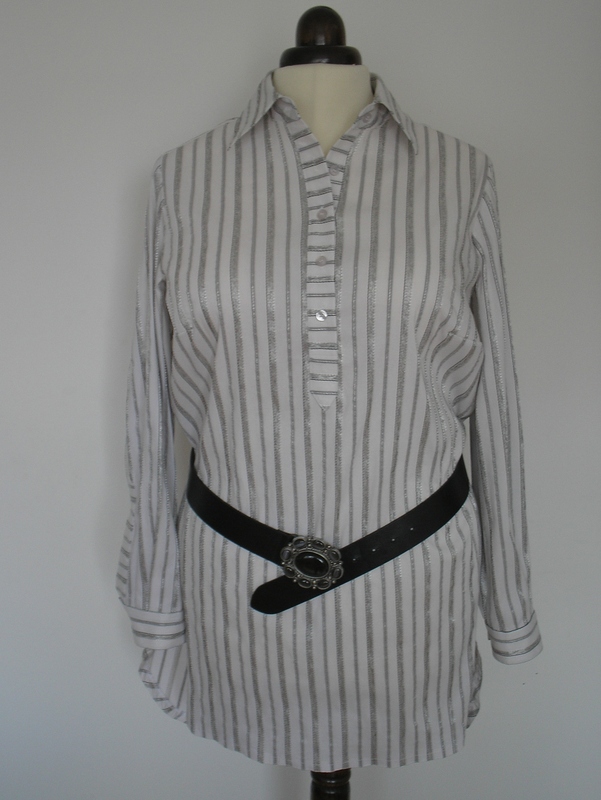 I started with a top from Patrones 302 (number 32 from the plus size section). 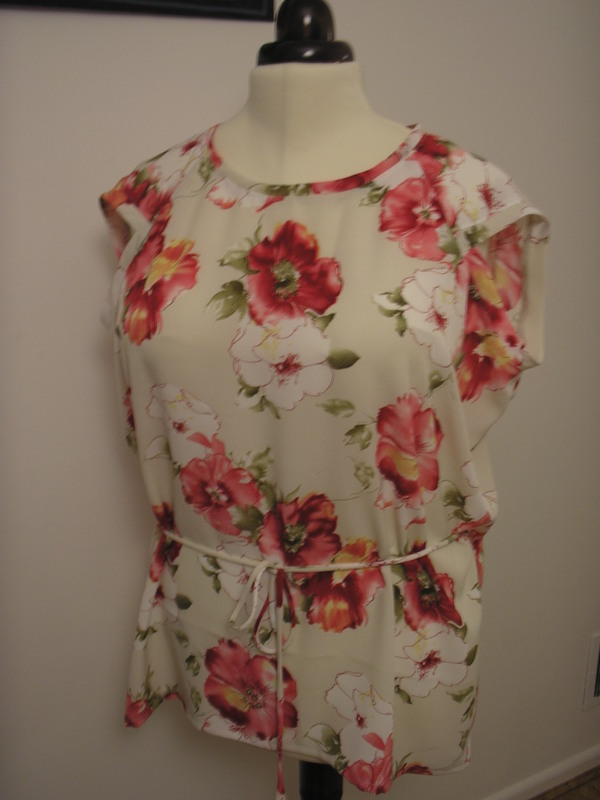 Whilst I am a 46 in trousers/skirts I always have to make a FBA in any tops/dresses I make s o given the unstructured shap e of this top I was happy just to try the size 50. I had been given this polyester crepe fabric by a friend and thought it would look good in this unstructured style. 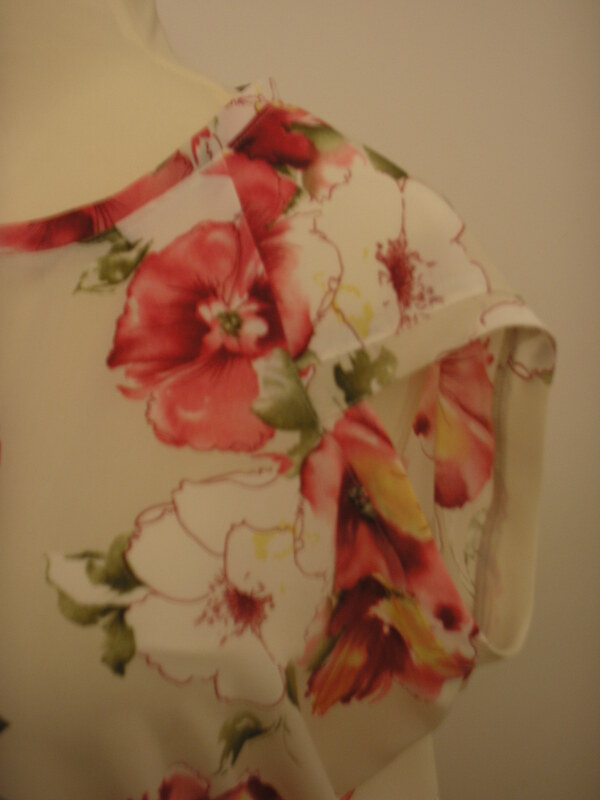 It was very easy to sew and I know that it is very easy care so should be a useful addition to my wardrobe. I really like the sleeve detail so I will definitely be making this top again. The seam gaps for putting the rouleaux belt through are possibly a bit too low for me so I will re-mark the gap to a higher position (making the gathering look a little more ’empir e line’). The belt was a very long rouleaux which looked as though it might be a pain to turn through but I used a turner that looks like a large needle with a lump on the end and had no trouble at all. I always make my loops with a ‘funnel’ to the top and two seams stitched close together which help to make the tube more stable. It looks just fine on Bessie and when I have someone around to take photographs I will get some on me.I have a pair of ‘Classic Jeans’ from another Patrones issue cut out to start tomorrow so I hope to have more to show you soon.